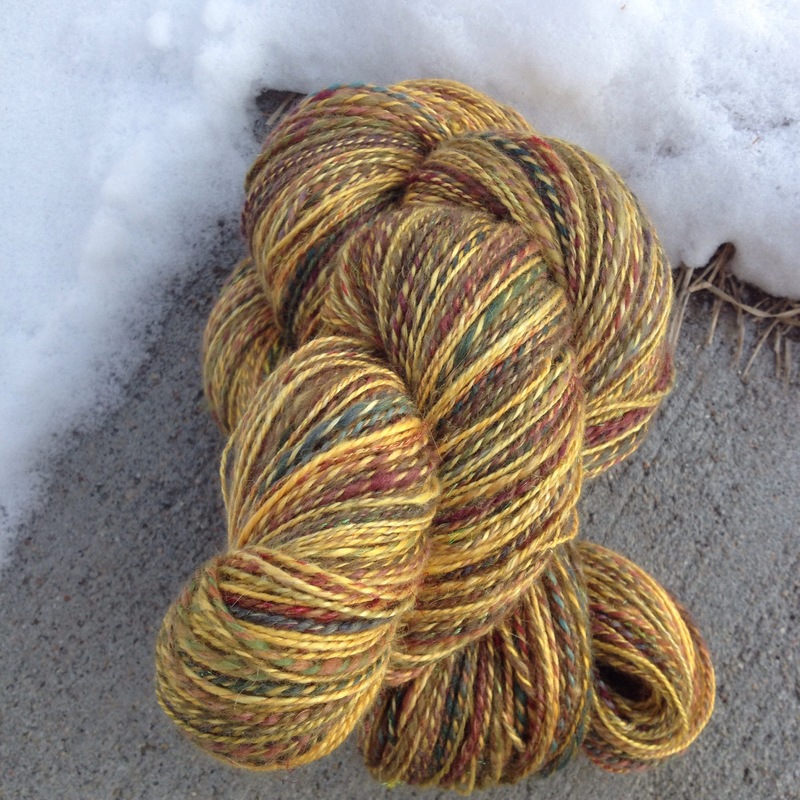 This year I knit over 13 miles of yarn, and spun over 4 miles of yarn. I blame complicated plying methods for the lowish spinning total, I concentrated on learning new things this year, and most of those new things required more intensive handling of the yarn. So the total seems low. In weaving, I did very little. Sadly. And my other favorite hobby, cycling, included mountain biking in Utah, which was truly amazing and terrifying. Along with that came an overwhelming desire to learn to ride my mountain bike better so that I would be less terrified on future trips. What will the new year bring? Hopefully more Joji sweaters, more spinning in general, ideally there will be a collapse weave project, and in biking I am determined to go to at least one all women’s mountain biking clinic in order to further improve my skills. Today I am sending out the old year with a massage, a first step in doing a better job taking care of my muscles and body so it doesn’t fail me when I need it to participate in all the activities I love so much. We’ve had Mr. Ink’s family in town since Saturday so life has been a bit whirlwind, but very very good. He has a sister in law who is so much like me that when she’s around, the two of us Cannot Stop Talking. It’s uncanny. But pleasant. However, I’ve done so little spinning and knitting in this time frame. I did have some time to begin my sleeve cap on the funky grandpa sweater. Both the grandpa sweater and the funky grandpa sweater have this type of sleeve cap, and it’s totally new to me. I figured I’d like to try the sleeve cap in stockinette rather than attempt it while adding cables. Now that I’ve done it once, I can say that adding cables should be no problem. 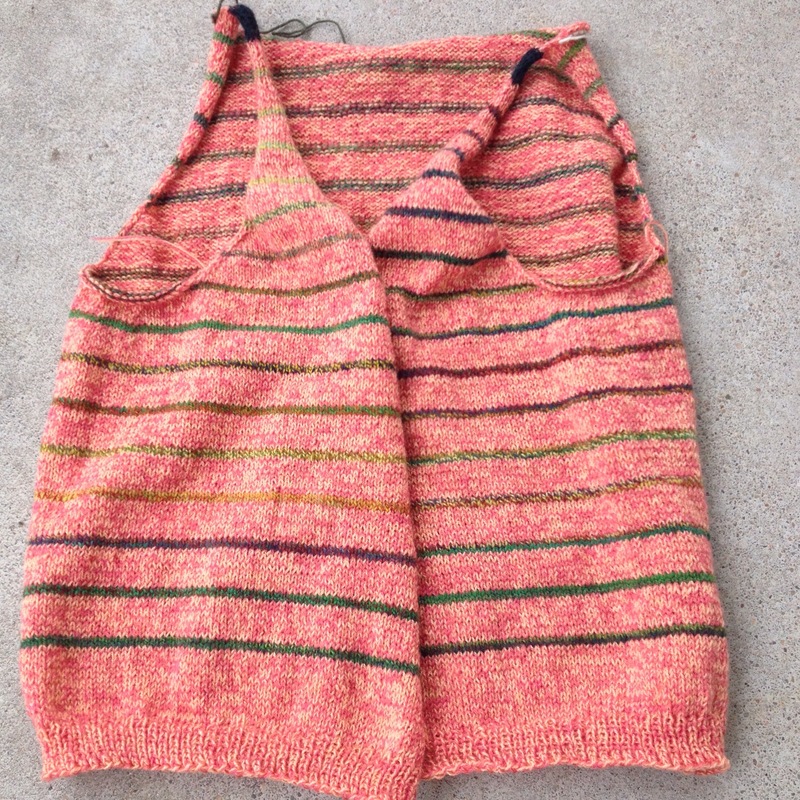 The sleeve cap is that black section of this unusual colored sweater. And what’s that behind it? Mr. Ink’s sister in law had us all shopping downtown, and I came across this fabulous rug. It was completely irresistible to me, as you all may know by now I absolutely adore color in every way. So, I got it for my living room, and it makes me happy every time I look at it. I am thinking that I had better put down this sweater and get moving on the Grandpa cardigan because, as you may remember, I am doing that one as a KAL with Umme Yusuf, and I hear she’s already on her sleeves while I haven’t even finished the neck increases! Happy New Year to all of you, I hope 2015 is one of your best! There’s nothing so happy to me as a set of spindles full of singles. Bonus points for yellow. Let the plying commence. 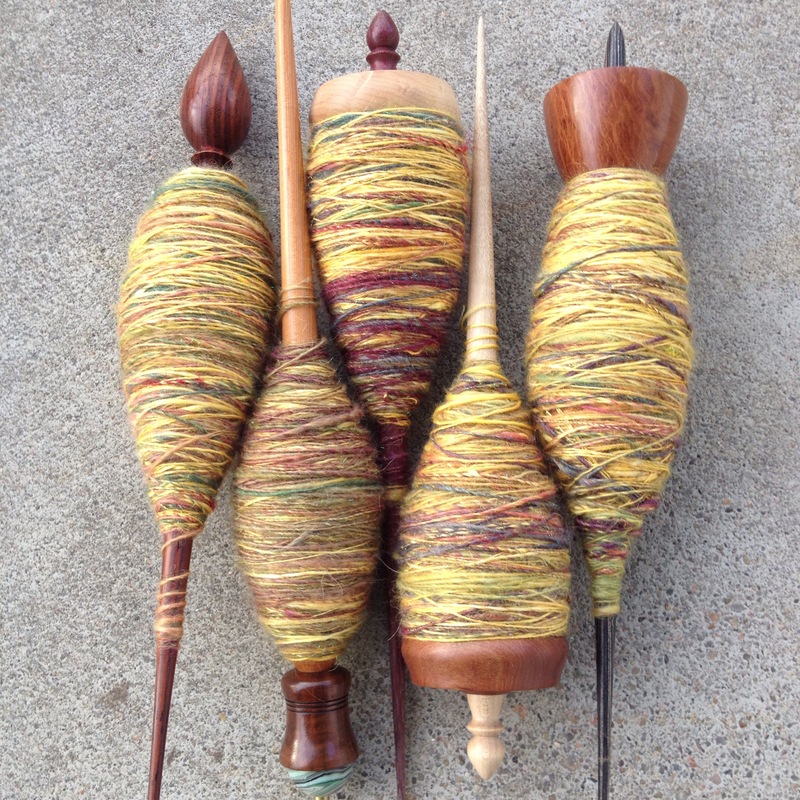 I’ll need those spindles for more happy yarn! 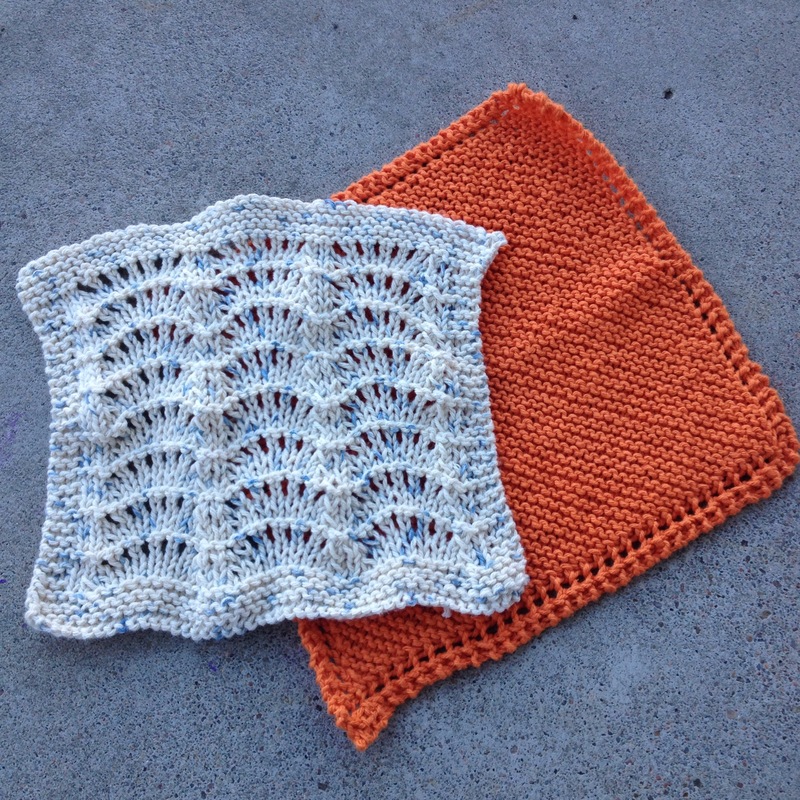 It’s official, my spinning mojo is in full swing and my knitting mojo right out the window. 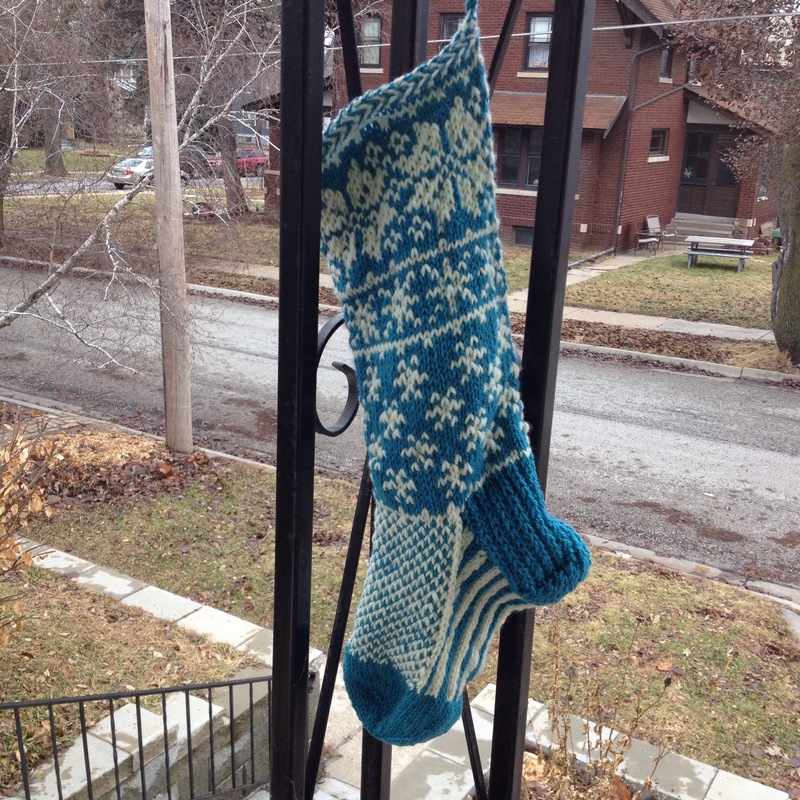 The final stocking this year, stocking #20 has been finished. Bug has requested this one, so the stocking is currently stuffed with gifts, as it should be. And, Bug’s previous stocking is wrapped and under the tree for Mr. Ink. Happy Christmas, Happy holidays, and I wish you all a wonderful day and remainder of this year. I am done working for the year. Or should I say, working at my place of employment. Done done done. It feels great. Now, to get the house in order for the holidays. But, before I work on the house, I figured I’d finish casting off the body of the Funky Grandpa sweater. To be honest, I want to start the sleeves of this one before I get to the sleeves on the Grandpa Cardigan. Believe it or not, new techniques totally worry me, despite having knit for ages and ages now. And so if I am going to mess up a sleeve, let it be a regular sleeve rather than a sleeve with cables on it! I thought I would lengthen this, but in the end I followed the pattern exactly. The writer was so specific about placement of strips and so on that I thought maybe I should just imagine she knows better than I do and go with it. We’ll see! I must say, we’ve had dreary rainy weather here, and no snow. 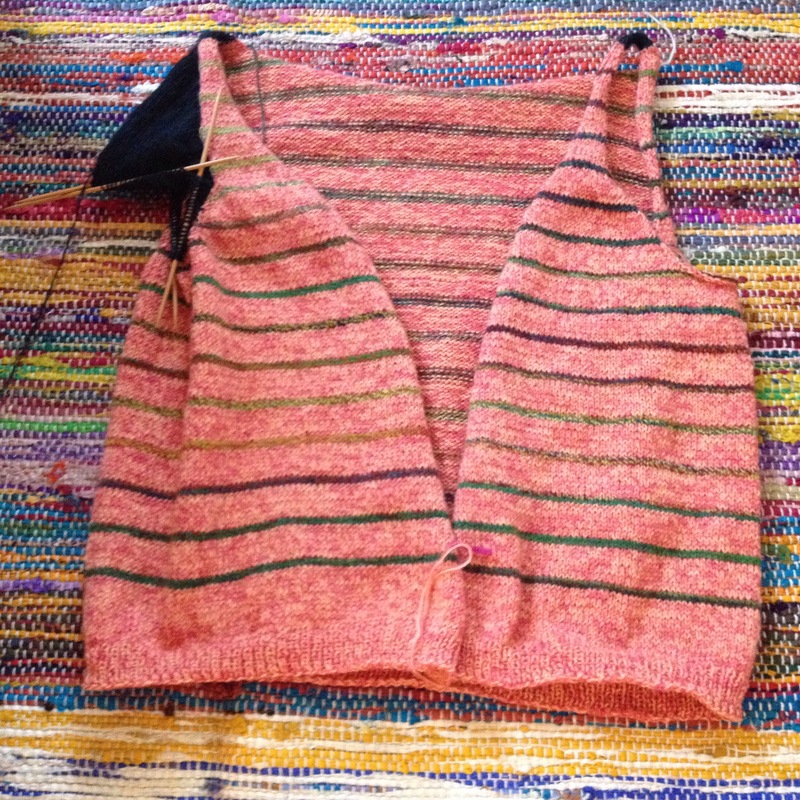 The brightness of this knit is very welcome these days! Yesterday I had goals. Goals to get stuff done around the house. Those just…flew out the window in the face of the Grandpa cardigan. Once I got started on it, I just wanted to get it to the point where I could connect the fronts and back. Somehow once that’s done, I really feel like I am on my way to a new sweater. So, in the end, that became my large concentration. It’s looking good! 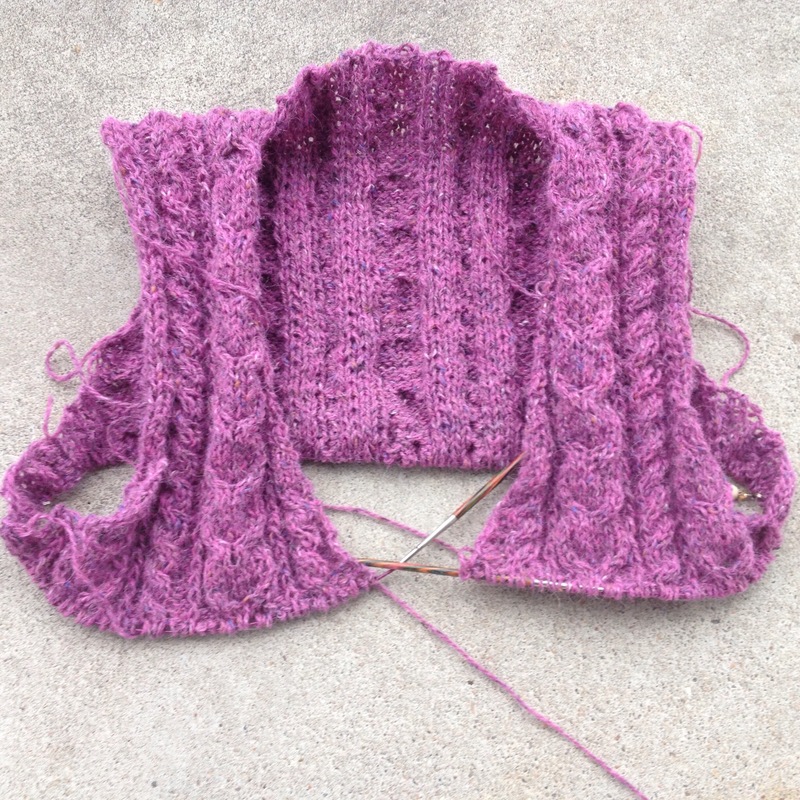 I’ve got less than an inch under the armpits done, and I am not done with the neckline shaping, but it’s coming along. Today we’ve got a nice bike ride planned, and I’ve been making food lists to get us through the holiday, so grocery shopping will soon be necessary. I do hope holiday planning for everyone is going well, and not too overwhelming!